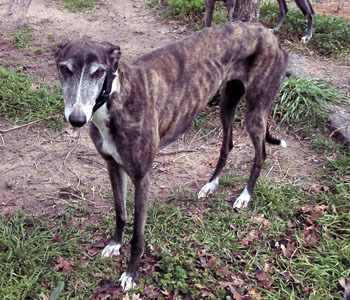 Angela is a 4½-year-old dark brindle female born May 12, 2007. She was not individually registered, but her sire is Late Late Show and her dam is Mollie Sullivan. Angela never raced, as she had surgery on her right rear leg as a puppy. The muscle is atrophied, but she gets around just fine. Angela has been in a home for most of her years, but has been surrendered to GALT due to owner illness along with Amber and Millie. This pretty girl would love to meet you!